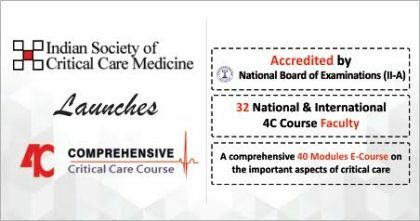 New Delhi: Indian Society of Critical Care Medicine has started an online e-course Comprehensive Critical Care Course (4C) to impart the benefit of this to a large number of physicians in India and worldwide. This course has also been accredited by National board of Examinations. The Rationale: An Intensive care physician needs to have basic knowledge of Mechanical Ventilation, Hemodynamic Monitoring, Airway and Trauma Management, along with a comprehensive knowledge in medicine, cardiology, nephrology, gastroenterology, pulmonology, infectious diseases, and anaesthesia. So it has become essential for all care givers to keep themselves well versed and updated with the latest advances in this field. Organiser- Indian Society of Critical Care Medicine founded in 1993 and still growing stronger & bigger with over 9000 members at present. And the great news is that critical care medicine has now established itself as a standalone super specialty in India and even all over the world. Indian College of Critical Care Medicine under The Indian Society of Critical Care Medicine has been training physicians in various courses like Post MBBS course, Indian Diploma in Critical Care Medicine (IDCCM), Indian fellowship in Critical Care Medicine (IFCCM) and Indian Diploma in Critical Care Nursing (IDCCN) at more than 250 institutions, nationwide. The 4C course has been conceptualized coordinated and executed by Dr Rajesh Chawla as chief coordinator and moderator.Dr Rajesh Chawla,Past President of Indian Society of Critical Care Medicine is currently working as senior consultant in Respiratory Medicine and Critical Care Indraprastha Apollo Hospitals New Delhi.